You can see what I made of it all after the gallery. In one way, nothing has changed at Coffee@33 in the five years since my previous visit. Sadly, it was dark when I got there, so I can’t tell you if there’s a sign outside, but otherwise, the interior is remarkably similar. The counter is still on the left-hand side, with space in the window for a long bench, covered in coffee sacks. Over on the right-hand wall, the two narrow counters remain, while the door at the back still leads to the garden. The furniture, however, has changed, the coffee table by the window becoming longer and thinner, and the stand-alone wooden bars becoming more substantial affairs, attached to the wall with brackets. Meanwhile, the grey plastic stools with square tops have become black plastic stools with round tops. The biggest change is the counter, which, while retaining the same basic layout, underwent a make-over in June 2018. The cakes and sandwiches still come first, but the large La Marzocco Linea espresso machine at the far end has gone, replaced by the angular black lines of twin group heads belonging to a Mavam modular espresso system, the bulky boiler and pumps relegated to beneath the counter. A more subtle change has occurred with the pour-over, where Kinto V70 drippers have replaced the Melitta-style filters of five years ago. In the words of Taras, you can think of the shop as Coffee@33 version 2.0. It’s the same as version 1.0, just upgraded. The really big change, however, came in 2015 when Coffee@33 bought a small hot-air roaster for the shop. However, it was soon outpaced by demand, so Taras moved to a dedicated roastery with a larger, more conventional gas-fired roaster. However, by the end of 2018, even that had been outgrown, so Coffee@33 returned to its original partnership with Horsham Coffee, roasting on Horsham’s new Loring roaster. Not only has this meant renewing ties with Horsham, but it signifies a return to air-roasting, this time on a high-capacity, efficient machine. Coffee@33 has a simple Brazilian/Nicaraguan espresso blend, accompanied by several single-origins which Taras selects for their contrasting flavours compared to the blend, although he is very enamoured with African coffees. All this is served from a simple espresso menu, where the blend is joined by a single-origin (an Ethiopian during my visit), with another (Kenyan) on pour-over. I’d been drinking espresso all day and while tempted by the Ethiopian, I opted for the Kenyan pour-over, served in carafe with a cup on the side. It was a lovely, smooth, subtle coffee with plenty of fruity notes, but not the punchy juiciness (which can be overwhelming at times) that you get with some Kenyans. I paired this with a Brie, tomato and spinach wholemeal baguette, served toasted, with the Brie melting out of the sides, a very tasty end to an excellent day. There’s a full write-up of Coffee@33, including a complete gallery, in its main entry. You can also see what I made of it in my original write-up, from September 2013. If you enjoyed this Coffee Spot, then take a look at the rest of Brighton’s speciality coffee scene with the Coffee Spot Guide to Brighton & Hove. 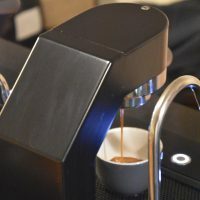 This entry was posted in Brighton & Hove, Cafe/Roaster, Cafes, Cake, Coffee Gardens, Coffee Spot Updates, Retailers, Sandwiches, Stations Nearby and tagged Coffee@33 by Brian Williams. Bookmark the permalink.